A black and white photograph of 109 Centre Street South. 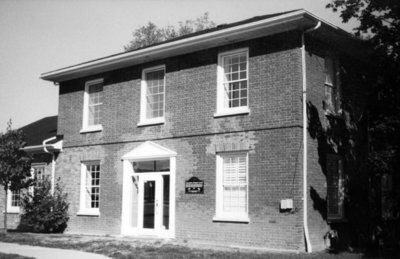 The Upper Canadian Loyalist brick house was built c.1852. It was the home of the first Postmaster for Whitby, Alexander McPherson. Later it became the home of the honourable Judge George Young Smith and from 1921-1951 it was a Baptist Parsonage. The house is located at the corner of Centre Street South and Colborne Street. It is 109 Centre Street South and 218 Colborne Street. 109 Centre Street South, October 2005, Carl Ferencz. Whitby Archives A2013_017_005.